A fiscal year is a 12-month period that an organization uses to report its finances. It starts at the beginning of a quarter, such as January 1, April 1, July 1, or October 1. The organization can be a government, business, or nonprofit. The finances represent the past year's revenue, costs, and profit margin. The managers compare actual to the budget to determine whether they have met their goals. A fiscal year can coincide with the calendar year, which starts January 1. Most organizations must use this because it's also the tax year. The only exception is corporations. FY 2020 is between October 1, 2019 and September 30, 2020. FY 2019 is the budget for October 1, 2018 through September 30, 2019. Why does the federal fiscal year begin on October 1? Because that allows newly-elected officials to participate in the budget process for their first year in office. For example, President Donald Trump and the Congressional members elected in November 2016 took office in January 2017. The Trump administration proposed its FY 2018 budget on February 27, 2017. FY 2006 - The War on Terror increased military spending to $566 billion. That made it the highest budget item, even more than Social Security at $550 billion. It increased the budget deficit to $248 billion. FY 2007 - The last year before the Great Recession had a deficit of only $161 billion. FY 2008 - This pre-recession budget focused on the War on Terror. The deficit was $459 billion. FY 2009 - President Obama added the Economic Stimulus Act to President Bush's FY 2009 budget to fight the recession. That created a record deficit of $1.413 trillion. FY 2011 - The deficit for FY 2011 was $1.3 trillion, the second largest in history. Thanks to the election, the lame-duck Congress missed its September 30, 2010, deadline to agree on it. Instead, they waited until the midterm elections were over. Temporary spending orders kept the government running until April 2011. The president and Congress averted a government shutdown when they agreed to $80 billion in spending cuts. FY 2012 - The federal government received $2.450 trillion in revenue but spent $3.537 trillion, creating a $1.087 trillion deficit. A continuing resolution allowed the government to keep running until Congress approved the budget on December 31, 2011. FY 2013 - This budget was never approved. Instead, the government operated with across-the-board cuts called sequestration. As a result, only $3.455 trillion was spent, lower than the $3.8 trillion estimated by the Obama administration. Revenue was $2.775 trillion, also better-than-expected. The deficit was $679 billion. Why wasn't the budget approved? Tea party Republicans refused to enact another continuing resolution unless Obamacare was defunded. The government shut down for 16 days before they agreed to keep things running until January 15, 2014. Meanwhile, another bicameral conference committee negotiated the FY 2014 budget by December 15, 2013. FY 2014 - The deficit was $485 billion, after taking in $3.021 trillion in revenue and spending $3.506 trillion. FY 2015 - With revenue of $3.250 trillion, and spending of $3.688 trillion, the budget deficit was $438 billion. FY 2016 - Spending of $3.876 trillion was $600 billion more than $3.276 trillion in revenue. Mandated benefits cost $2.487 trillion. Congress appropriated $1.15 trillion to discretionary programs. It added $82.8 billion in emergency funding. FY 2017 - Obama's last budget was $4.073 trillion in spending and $3.632 trillion in revenue. That created a $441 billion deficit. FY 2018 - Total projected spending was $4.109 trillion. The revenue estimate was $3.33 trillion. That created a $779 billion deficit. FY 2019 - Projected spending is $4.407 trillion, more than the estimated $3.529 trillion in revenue. That creates a $1.091 billion deficit. FY 2020 - Projected spending is $4.746 trillion. The U.S. government estimates it will receive $3.643 trillion in revenue. That creates a $1.103 trillion deficit. See how much the U.S. government spends versus what it earns annually by looking at its deficit by year. Studying the nation’s deficit by president will allow you to decide which U.S. president had contributed considerably to the total U.S. deficit. The tax year is the fiscal year for all individuals and most businesses. It starts on the calendar year, January 1. Taxes aren't due until April 15, three and a half months later. If you're wondering why April 15 is tax day, it's because Congress extended the deadline. It gives you more time to pay your taxes. It also gives the federal government more time to hold on to your money before issuing refunds. Most businesses must use the same tax year as their owners. 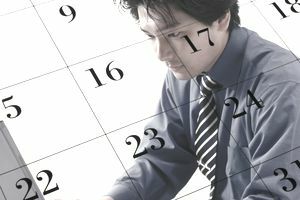 Single proprietors, partnerships, and S corporations use the calendar year. That goes for Limited Liability Companies that fall under those classifications for tax purposes. Companies use the fiscal year to track revenue, costs, and profits. C corporations file their tax returns separately from their owners. Their tax year coincides with their fiscal year. Their taxes are due three months later, on the 15th. Many corporations find advantages for starting the fiscal year other than January 1. For example, some businesses might choose to start their fiscal year in April for tax purposes. They can shift income and expenses to a month outside of the fiscal year to improve their taxable income. Businesses that are seasonal might start their fiscal year on July 1. A business that has most of its income in the fall and most of its expenses in the spring might start its fiscal year on October 1. That way, they know what their income will be for the year and can adjust their expenses to maintain their desired profit margins. Regardless of when their fiscal year starts, most companies report on a quarterly basis. That's critical for publicly-owned corporations. In the stock market, the beginning of each quarter is called earnings season.